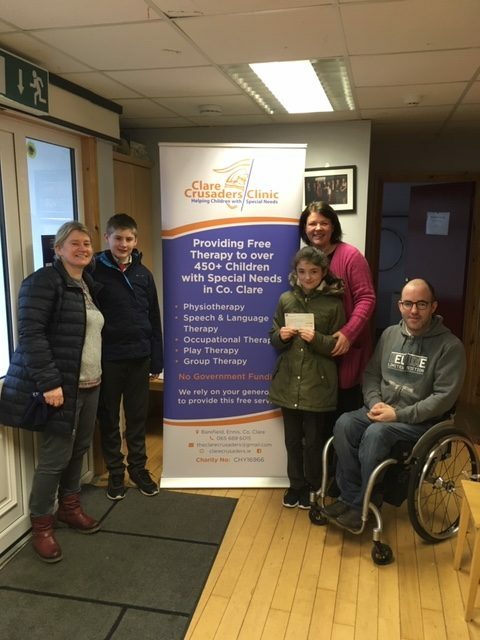 This week we made the journey across to the Clare Crusaders Clinic to present them with a cheque for the proceeds of the Christmas Raffle during the Christmas Concerts. They were very grateful to everyone who contributed to the raffle and delighted with the support from Ennis National School. The Clare Crusaders Children’s Clinic provides free therapy and specialist treatment to over 350 children with special needs in County Clare. They are a self financing service located in Barefield, Ennis. The Clinic receives no state funding and must raise over €250,000 per annum to provide the current level of therapy for children. Here is a picture of the presentation of the cheque.